When I invite friends and family over for dinner there are a few dishes that I know will never disappoint, and this three cheese macaroni recipe is one of them! Maybe it is just my family, but cheesy comfort food is everyone’s weakness. I know that if my relatives walk through the door and have any kind of cheesy goodness greeting them that they are going to leave my house happy and with a smile on their faces. 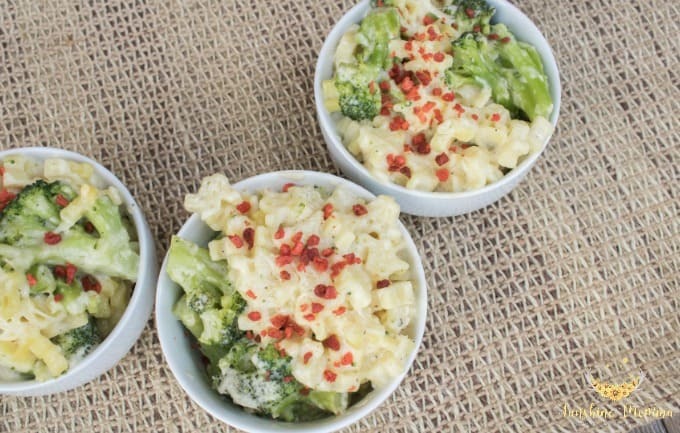 One of the great things I love about three cheese macaroni is that it is versatile. 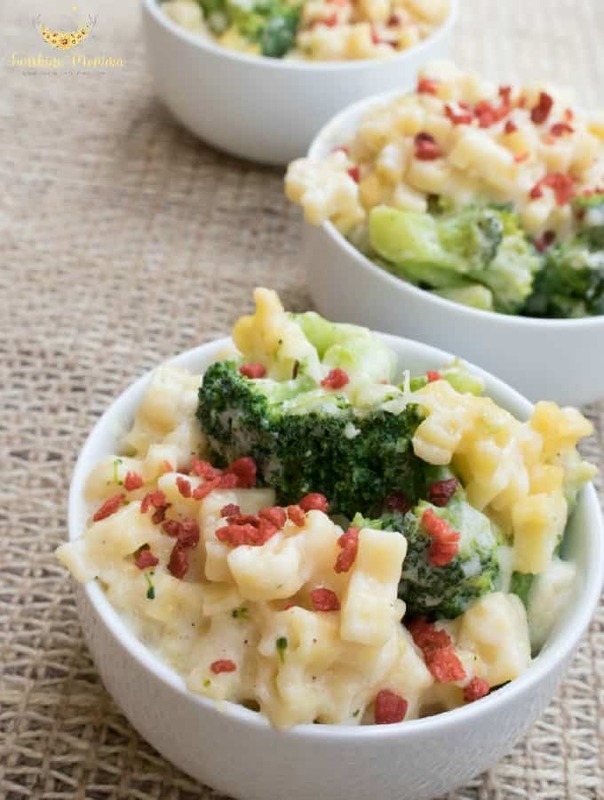 We add in broccoli and bacon usually, but you can also throw in some ground beef or shredded chicken to make the meal a little heartier. There isn’t just one time of year that this recipe is good either. It can be served as a main dish in the wintertime or as a side to a burger off the grill in the summertime. Our friends just had a baby and I am considering taking some of this dish over to them because it is so good and so simple to make. National Friendship Day is coming up and as a busy mom, I don’t always have the time to show my friends how much I love them. I am using this National Friendship Day to serve them this delicious Skinner® pasta dish to help bring them together and show how much I care, because what is more friendly than a room full of Texans and a dish full of pasta? So. Simple. Making this recipe is basically just a series of melting and stirring which I think almost everyone can do. My favorite pasta to use for any of my pasta recipes is Skinner® pasta. It is inexpensive and they have any shape pasta you could ever need…even Skinner Texas Shape pasta which is what we used in this recipe because come on…we’re Texans. Seriously, what is better than serving Texas Shape pasta to a crowd full of Texans? First you are going to cook the noodles just as you normally would and in the meantime, you are going to add the cheeses and other ingredients together in a second pot to melt. Make sure to continuously stir cheese mixture while you are making it! 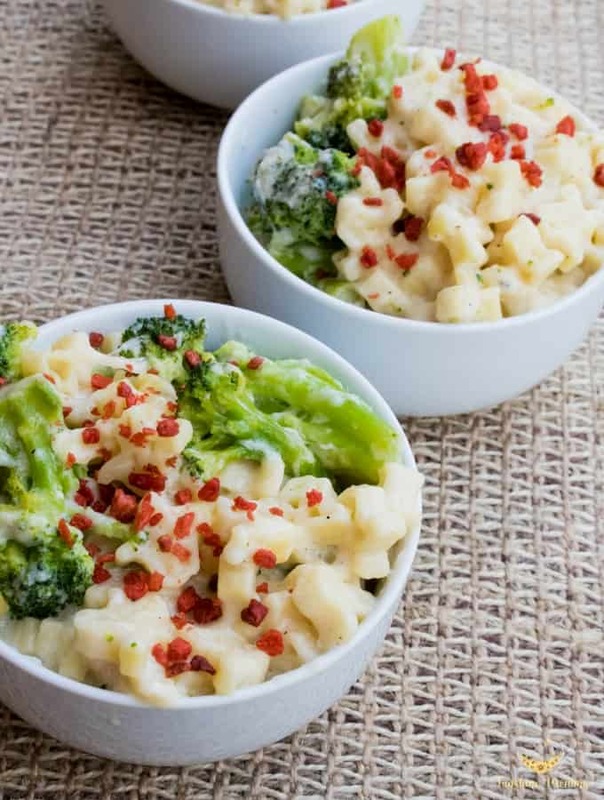 For this three cheese macaroni recipe I used Swiss, white cheddar, and Parmesan cheeses, but I am sure that you could recreate this recipe just fine with other cheeses. Then when you go to bake it I like to add an additional layer of shredded Swiss cheese on the top. If you’d like the top layer of cheese to be a little crispy (I love it like this!) you can turn the broiler on at the end of the bake time. Just be sure to watch it because it will cook quickly and you don’t want it to burn! Melt butter in saucepan. Whisk in flour and stir continuously for about a minute. Slowly whisk milk and half and half into the butter and flour mixture. Stir until thickened. Add all three cheeses to the pan, whisking and cooking until smooth. 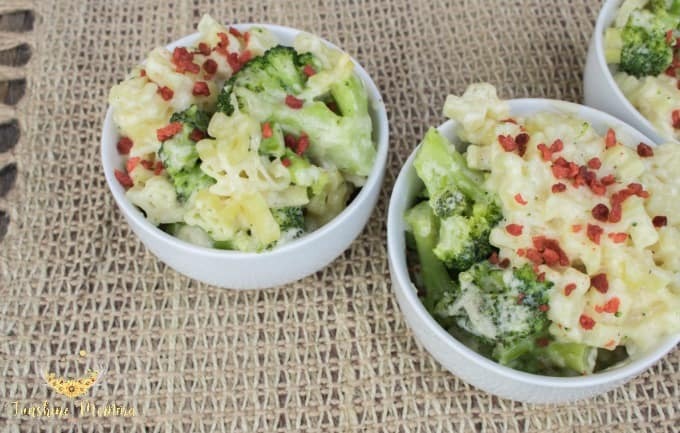 Combine cheese mixture and frozen broccoli with pasta and pour into a 13×9 baking dish. Add a layer of Swiss cheese to the top. Add pepper to taste and garnish with bacon crumbles if desired. Love this-nice and easy and looks delish! !